Search engine giant Google and its followers Bing and others are concentrating on bringing online searches for information more in line with the way people think and speak. This type of searching is known as ‘natural language search’. This move is a departure from the way of conducting web searches that has dominated since search engines first emerged in the ‘90s and forms an attempt at making searches faster and more accurate through understanding the intent of the searcher and to deal with more complex, combined queries. Natural language search also sits at the center of a number of technology advances taking place, including voice search, digital assistants and smart hubs for the home. So, what exactly is it, and will it affect or change the way we look for information online? Natural language search is a search that is carried out in common speech, phrasing questions in the way you would ask them if talking to a real person. These are queries typed into a search engine, spoken to a voice search, or a question to a ‘digital assistant’ like Siri or Cortana. This differs from keyword-based search, the default method of most people used to using web search engines. Keyword-based search attempts to break down a query to the most important words, getting rid of unessential connecting words like “and”, “how”, “the”, etc. Natural language search has been around since the internet was in its infancy, remember Ask Jeeves? It was the 90s search engine that asked users to phrase queries in question form. However, Ask Jeeves could have been seen as ahead of its time because keyword-based searches were the norm at that time, Jeeves was left outgunned by the more powerful keyword-based engines such as Google. Despite the demise of Ask Jeeves, there is a resurgence in search trends towards natural language searches. This comes about due to numerous developments in technology and search coming together. Firstly, search engines and Google in particular have improved search capabilities increasingly over the years to the point people expect to find what they are looking for straight away. There is reduced patience for entering different keyword combinations; people search on their mobile phones, while they are on the move, and they want to ask a question, get an answer, and carry on. Search engines have put a lot of work into meeting this expectation, so people will be satisfied be the service provided and experience no frustration. Second, search engine technology has steadily improved to a level where users have the ability to teach them to understand long and more complex queries that have different elements that modify each other and cannot work independently. Google now welcomes “complex questions” and its search engine now understands superlatives (largest, tallest) and “ordered items”, like lists of the tallest buildings in a given city, in order of height. 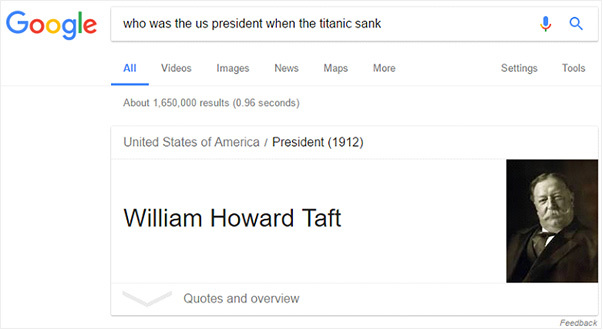 A screenshot of this search query shows Google's Knowledge Graph gives the answer "William Howard Taft" along with a photograph of the former president. Take note Google does not just try to give the right answer, but displays at the top of the screen within the Knowledge Graph, this eliminates the need to click on another site to find the answer. The third component that is contributing natural language search development is the emergence of voice search and digital assistants. Alexa by Amazon, Siri by Apple, Cortana by Microsoft, and Google’s Now are all AI assistants that are increasingly being adopted and, accordingly, their voice activation capabilities are increasingly being integrated into all types of technology. This technology may have been clumsy at first, but as with Google, it is steadily improving and this is leading people to become more used to speaking queries and commands aloud in natural language and in return expect an accurate response. As the most popular search engine in the world, it comes as no surprise Google leads the pack in terms of advances in natural language search. However, other search engines have followed suit. Microsoft in 2014 updated Bing smart search leading to improvements in the parsing of queries made in natural language. Bing later further developed this with the introduction of the “continue the conversation” feature after a question is asked in search. This allows you to ask a follow-up question based on the context of the previous one, and Bing will understand what you mean. 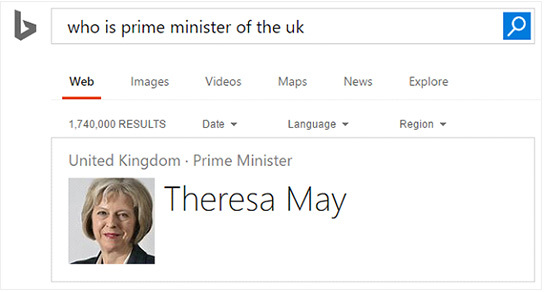 Here is a screencap of the top Bing search result for the query “Who is the Prime Minister of the UK?” with the response “Theresa May” displayed with Bing's Instant Answers. Newer search engines also making it their goal to have natural language search capability. The niche business-focused Plonked search engine which launched almost a year ago, aims to provide users with a natural language interface that keeps up with the search level offered by Google and all other main search engines. Where to next for natural language search? As well as the shift to natural language search across traditional search engines, there are greater developments underway in the ‘digital assistant’ arena, which is linked closely with voice search as digital assistants deal with search queries along with myriad other tasks. Siri, Alexa, Cortana and others all pose a threat to Google’s search dominance, and rumors abound of Google plans to develop its own voice-controlled assistant to go head-to-head with Amazon’s Echo in the smart home space. Search engines are increasingly moving to natural language search to better understand the desires and goals of searchers online, but natural language is a critical component in the most important developments happening in the technology field.